The phenomenal growth in the number of multi-device users is driving the demand for responsive online courses, which can be accessed seamlessly on any device. But, what does it take to develop a responsive e-learning course? Well, one of the key aspects to consider is the choice of the rapid authoring tool. 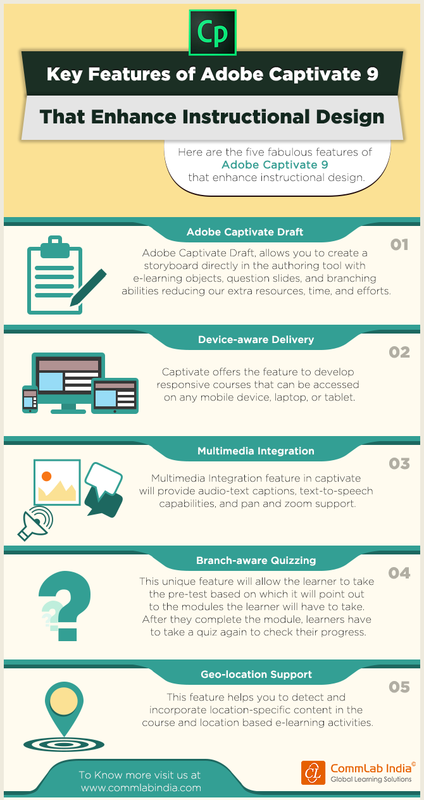 And, one of the most popular rapid authoring tools used to make responsive online courses is Adobe Captivate. A survey conducted by E-learning Guild showed Adobe Captivate is the most widely used rapid authoring tool. The latest version of this software, Adobe Captivate 9 has various features that facilitate smooth responsive e-learning development. Excited to know the features? Then, check out our infographic below.